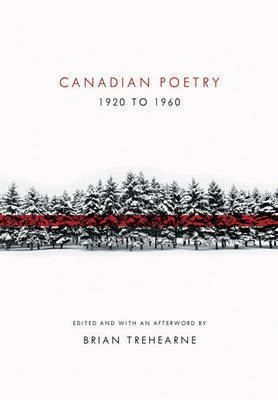 The best in four decades of exceptional Canadian poetry, now in a limited hardcover edition. 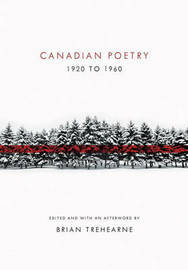 The poets in this anthology, all of whom matured creatively between 1920 and 1960, considered it one of their primary obligations to modernize Canadian writing, to bring the country's poetry out of late Romantic stasis after the Great War into a fertile and combative response to the cultural, political, technological, philosophical, religious, and economic conditions of the modern era. In their common reaction against Romanticism, and in their commitments to modern poetry's possibilities of profound newness, the poets in this volume make up one great movement in Canada's cultural history. The anthology includes: - 250 poems by 44 poets - Regionally diverse voices from Newfoundland, the Maritimes, Quebec, Ontario, the Prairies, and B.C. - Extensive selections of the work of major poets - An afterword and biographical headnotes provide important historical and literary context The poets included in Canadian Poetry from 1920 to 1960 are: Frank Oliver Call; Louise Morey Bowman; Raymond Knister; Joe Wallace; E.J. Pratt; W.W. E. Ross; F.R. Scott; A.J.M. Smith; Charles Bruce; Earle Birney; A.M. Klein; Dorothy Livesay; Leo Kennedy; Audrey Alexandra Brown; Kenneth Leslie; Robert Finch; Floris Clark McLaren; L.A. Mackay; Anne Marriott; Bertram Warr; Patrick Anderson; P.K. Page; Kay Smith; Miriam Waddington; Margaret Avison; A.G. Bailey; Louis Dudek; John Glassco; Ralph Gustafson; Raymond Souster; Irving Layton; Roy Daniells; Douglas LePan; George Whalley; James Reaney; Elizabeth Brewster; George Johnston; Goodridge MacDonald; Jay MacPherson; Anne Wilkinson; Phyllis Webb; Wilfred Watson; R.A.D. Ford; Eldon Grier. From the Hardcover edition. BRIAN TREHEARNE is a professor of English at McGill University. His previous books include The Complete Poems of A.J.M. Smith and The Montreal Forties: Modernist Poetry in Transition. From the Hardcover edition.